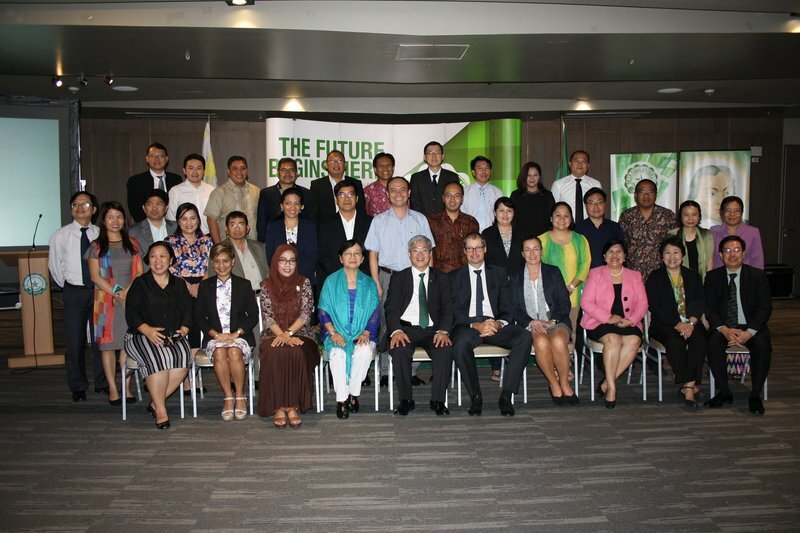 A warm welcome was given by the De La Salle University and the Chancellor Prof. Dr. Gerardo Janairo (front, centre) in the Philippine capital city of Manila to the deans from Southeast Asia who participated in the second part of the training programme International Deans’ Course of the Osnabrück University of Applied Sciences. 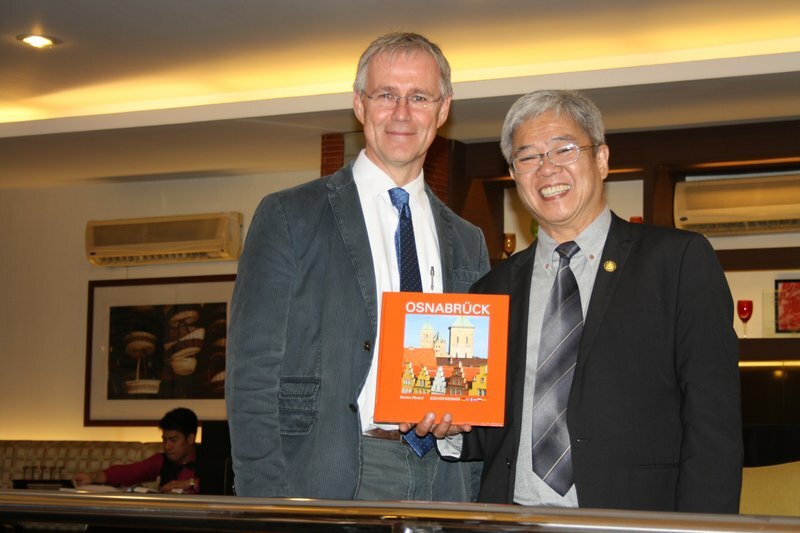 At the end of the course, project director Prof. Dr. Peter Mayer (left) presented to the Chancellor Janairo an illustrated book of Osnabrück. Janairo himself is an alumnus of the first IDC Southeast Asia which took place from 2008 to 2009. The deans from Southeast Asia who participated in the "International Deans’ Course" (IDC) took part in a three-day long varied programme for further education. This year, the second part of the three-part training took place on their home continent - hosted by the De La Salle University in the Philippine capital city of Manila. Following the successful start of the one-year programme in Osnabrück this June, the participants from Cambodia, Indonesia, Laos, Malaysia, Thailand, Vietnam and the Philippines gathered for the second stage of the programme. Besides the subjects Change Management, University Rankings and new development for universities in Asia, especially Project Planning covered the syllabus. 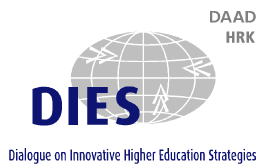 Each dean developed and initiated a project which is linked to his home university. Teaching professors from Germany and Asia supported the deans by providing new input. Vice-Rector Aye Aye Tun from the Dagon-University in Myanmar engaged in the integration of a Service-Learning-Module of the bachelor curriculum of her university – being delighted with the current success of the accompanied project. "The implementation of my practical project in cooperation with my mentors is highly interesting, truly a successful story. I am optimistic that with the knowledge from the IDC I am able to reform the higher education system in Myanmar and of the Dagon-University. I am sure that this knowledge will be useful for me - directly or indirectly - for the rest of my life." For the future of her university, Vice-Rector Aye Aye Tun seeks more autonomy. Furthermore, she wants to promote reforms within the Myanmar educational system among her colleagues in education, research and administration. "We need more personnel and means to upgrade the IT-infrastructure on the campus", says Tun. Project director Prof. Dr. Peter Mayer from the Osnabrück University of Applied Sciences was genuinely fond of the intense exchange – especially because of the encounter of different perspectives. "On the one hand some participants come from very renowned internationally accredited universities and on the other hand others come from little established universities. For example Malaysia is quite highly developed whereas Laos is rather less developed. Additionally, the participants come from public institutions and private universities. This creates a unique atmosphere of learning which is appreciated by all participants. This exchange is an intellectual enrichment for everyone." The third and final section of the education programme takes place in the beginning of 2017 in Yogjakarta on the Indonesian island of Java.